You will have your breath taken away when you walk into this spectacular award-winning home. 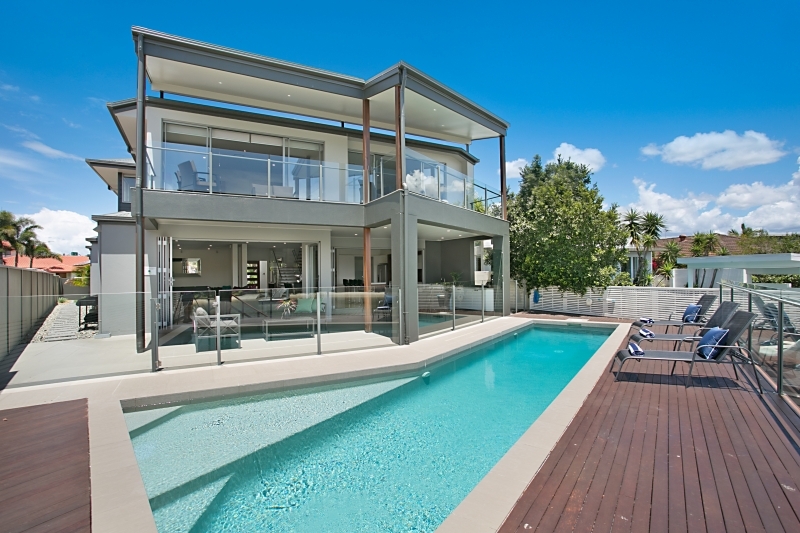 This huge north facing waterfront mansion epitomises the best of luxury Gold Coast living. With four separate entertaining areas the layout of the home ensures you can accommodate up to 15 people with modern ease. Whether your stay is for business or pleasure, you will love the ambience of Xanadu and the location. Only steps to the redeveloped Pacific Fair shopping centre (largest in QLD) and all the restaurants and shops on offer. The spacious open plan living flows seamlessly to the alfresco dining and entertaining area surrounding the pool and adjoins the games room with pool table. You can enjoy the ambience while overlooking the waterfront and sandy beach by day and the fabulous skyline lights at night. 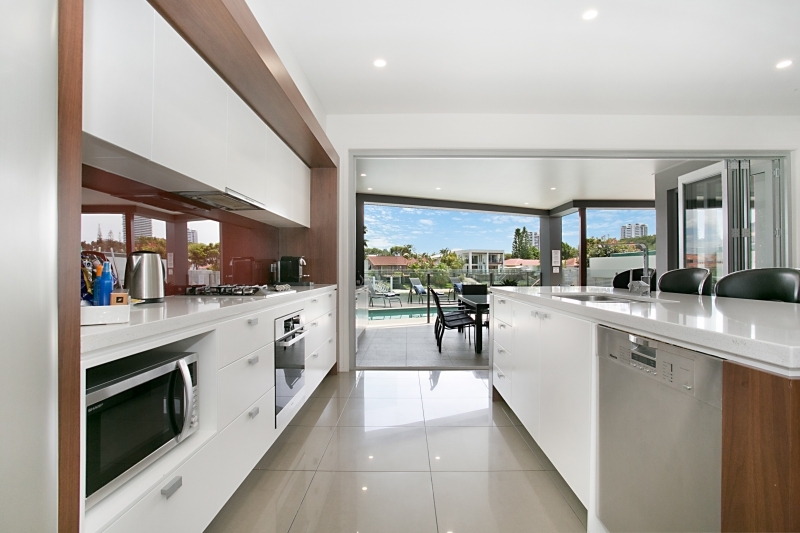 The modern kitchen opens via bifold doors to an undercover outdoor kitchen/bar and BBQ area. You can dine inside or may prefer the alfresco dining by the sparkling in ground pool. 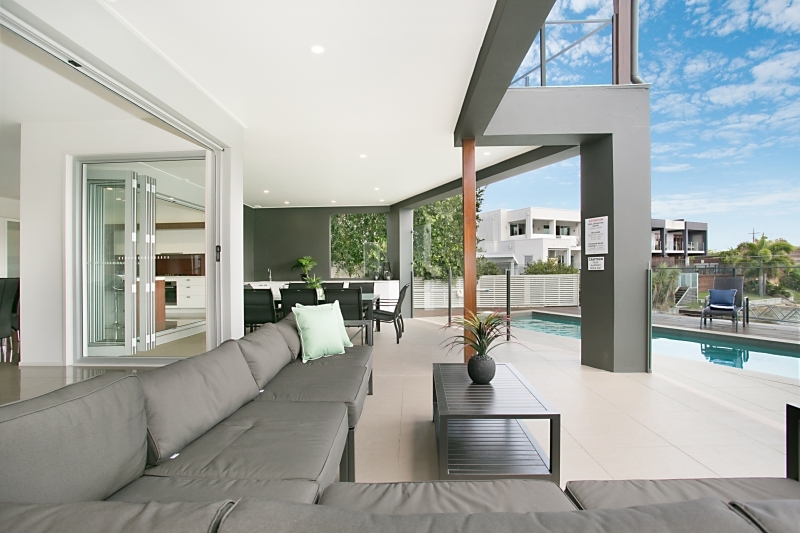 The large outdoor lounge provides you with plenty of space to relax and unwind. 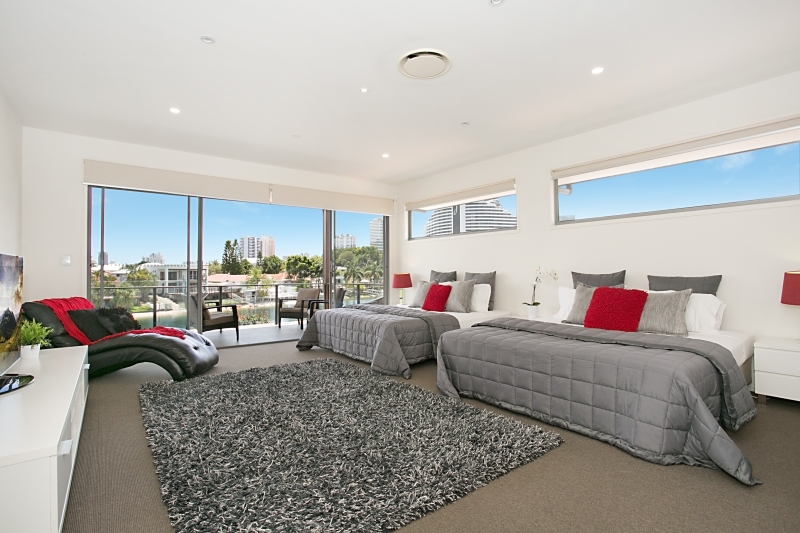 The huge master suite incorporates an open ensuite with spa bath, large dressing room and private balcony looking along the water to the city skyline views. 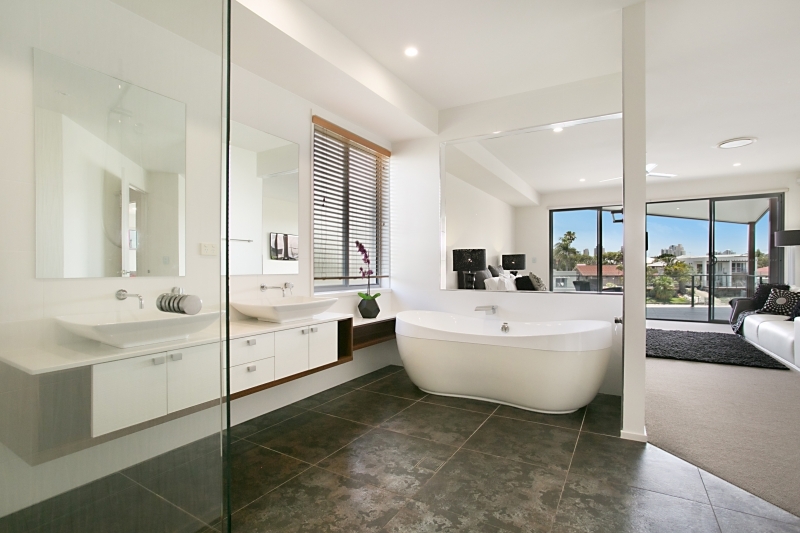 There are three other bedrooms and a full bathroom on this level and two further bedrooms, one with an ensuite and a powder room on the ground floor. The six spacious bedrooms, three bathrooms and powder room cater for groups or families holidaying together allowing your own private space. There is a two car garage on the property. 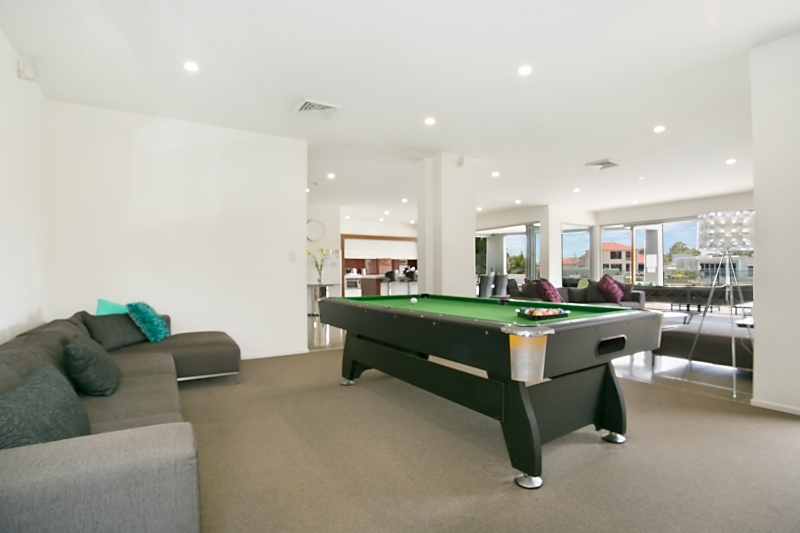 If entertainment is an important part of your holiday you will love the pool table, four televisions & Wii. The home also has free Foxtel. 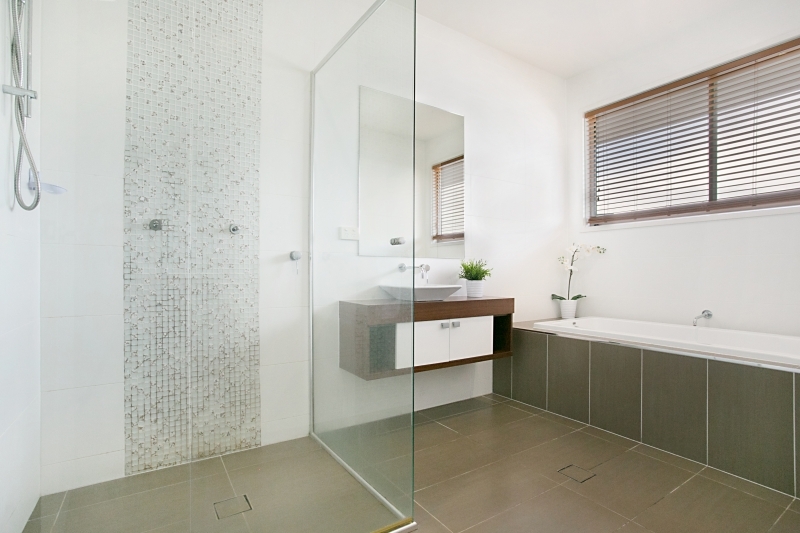 Zoned ducted air conditioning is included for year round comfort. 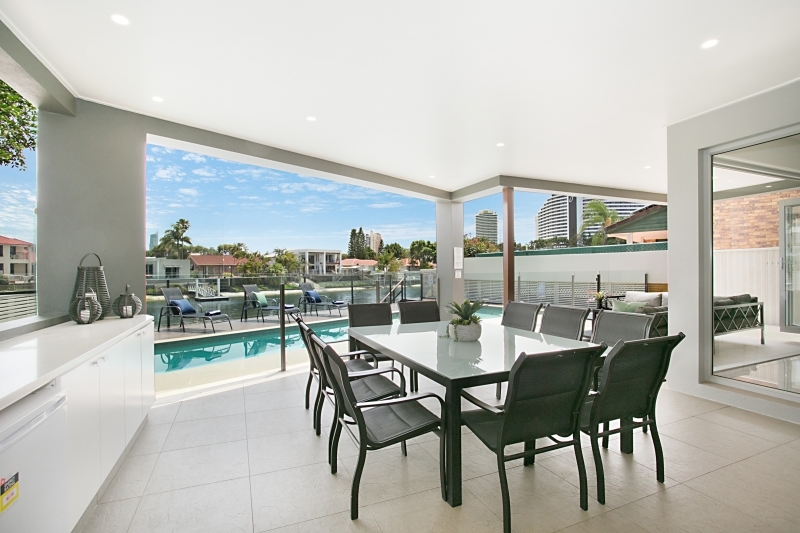 This home is situated in a premier location only 5 minutes walk to Pacific Fair and all that Broadbeach has to offer. 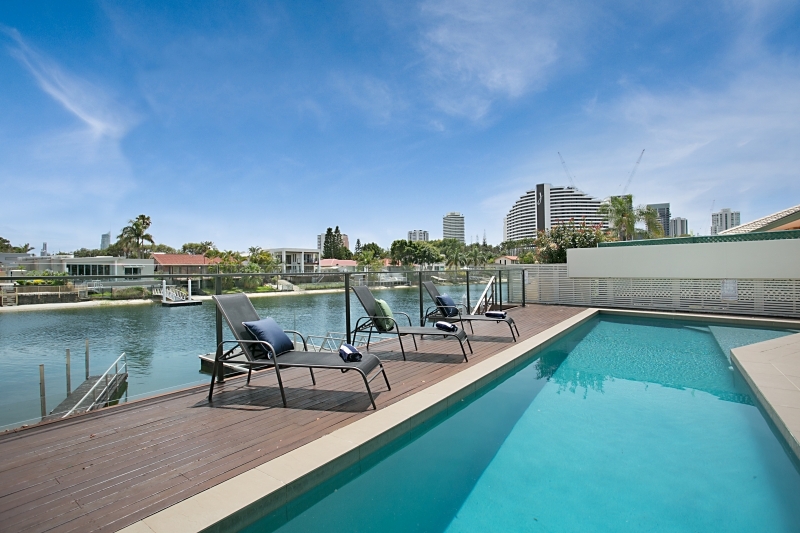 Broadbeach is well known as the best location to holiday on the Gold Coast. With the fantastic restaurants and cafes, shopping, nightlife, Casino and Convention Centre and of course our beautiful beaches it is the perfect holiday destination. 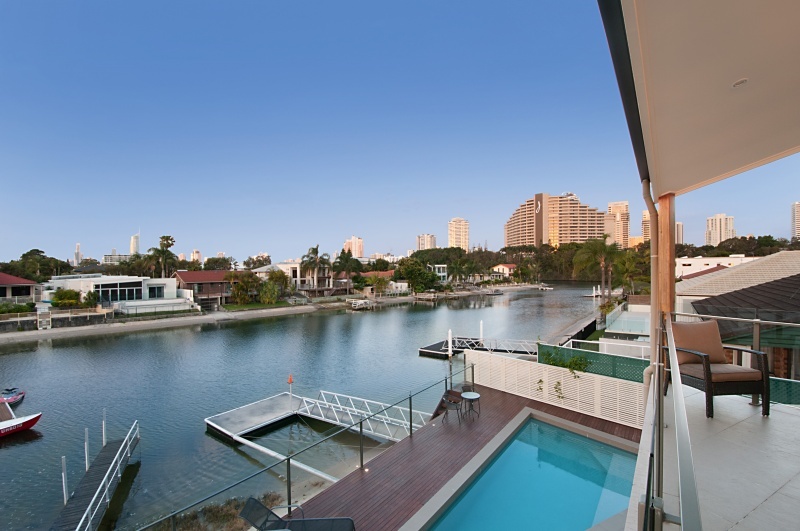 The home is central to all the Gold Coast has to offer. 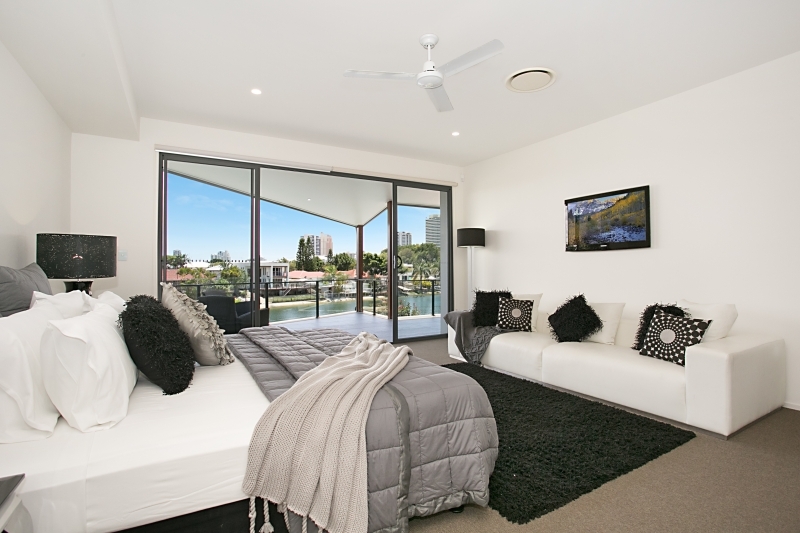 If this home does not suit your requirements then talk to us as we have many Elite Holiday Homes on the Gold Coast to rent. Please do not hesitate to contact us to discuss any aspect of your stay. We had a stay at this property and it is amazing. Nine guys on a boys golf trip. 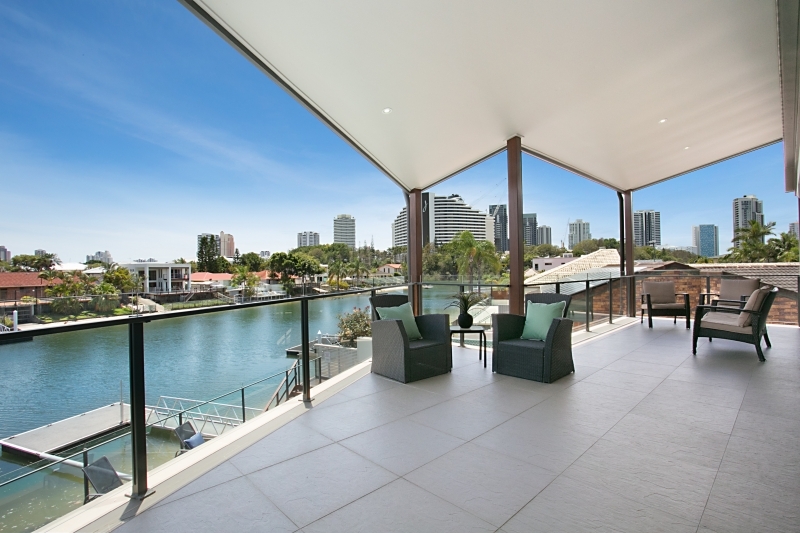 The entertainment area’s are superb with the kitchen/living following on to the outside area, then flowing on to the pool, then flowing on to the jetty and waterway. Very close (walking) to Pacific Fair and Broad Beach/Oasis area. Communication with the Elite Homes team is very good and the payment process was very easy. Will be back again. A great location and a great property. Xanadu had everything we needed for a comfortable stay. Close to Pacific Fair, the Casino, beach and restaurants. Totally brilliant week’s stay for extended family group of 15. Great configuration of bedrooms allowing male cousins to sleep together, separate from female cousins and two-year old in with her parents. Amusement provided for all ages although solar heating for pool would have enabled parents to swim with children on cold April days ! Perfect location within walking distance of Pacific Fair and short drives to beach and theme parks. Our group had an absolutely amazing 5-day stay at Xanadu Waterfront. 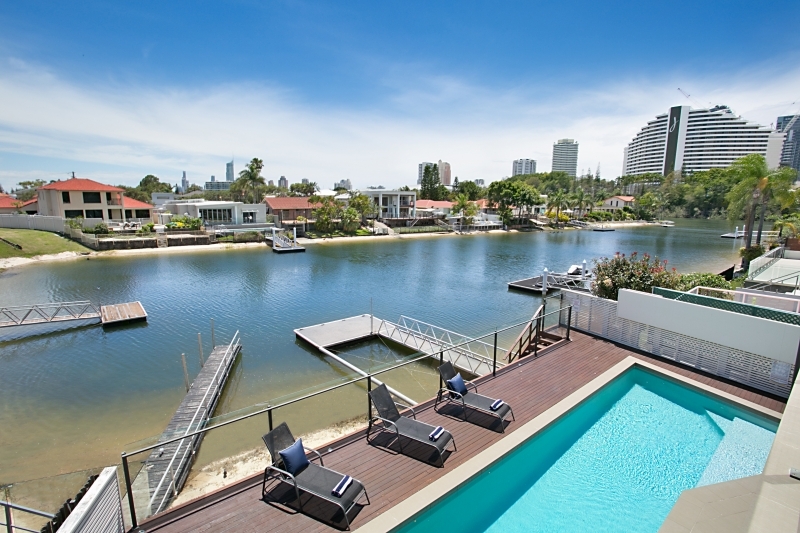 The location couldn’t be more perfect-only 5min walk to Pacific Fair, 10min to Star Casino and close to the beach also. The house itself is gorgeous. 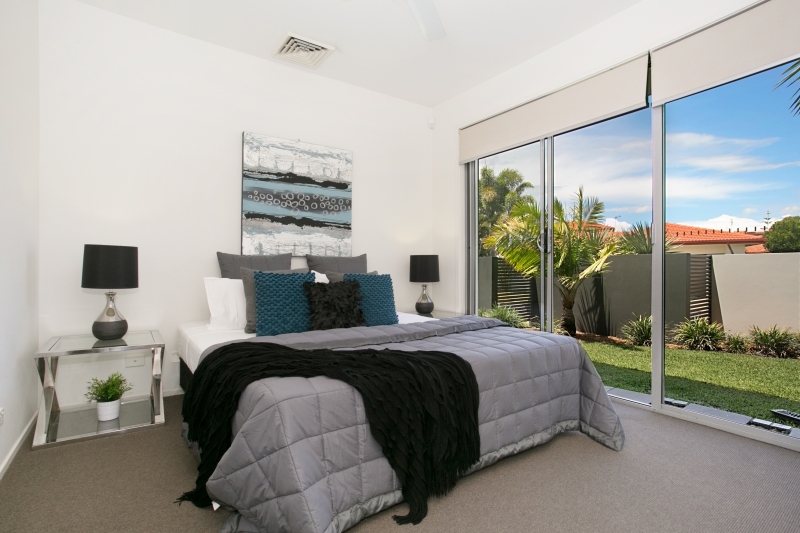 Huge bedrooms and plenty of living space to accommodate large groups. We had planned on going out for dinners however we found that we preferred spending our evenings in at the house. We particularly enjoyed sitting outside, cooking on the BBQ and loving the outdoors life! We highly recommend this home to others and will definitely book through Elite again. Great value for money and a wonderful experience. Had the pleasure to spen 8 days at Xanadu recently. First impression were wow!!! Last impressions were wow!! 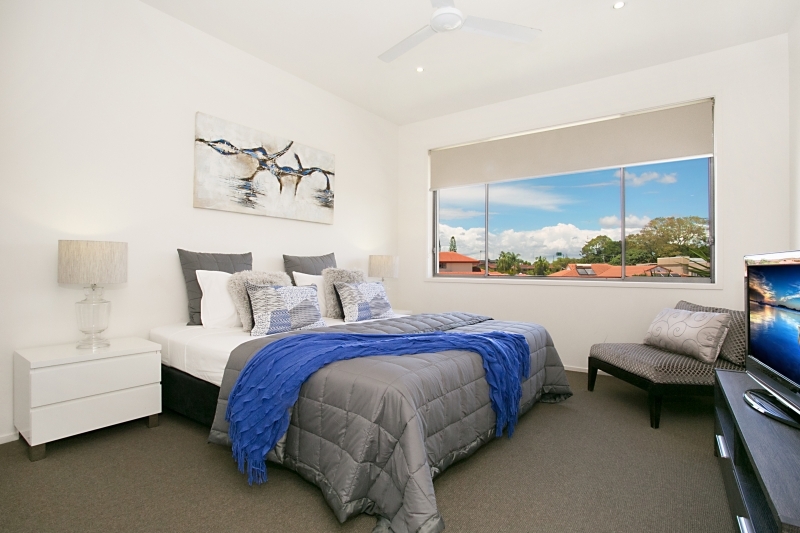 Very comfortable, had 2 small grandchildren the property secure, private and realxing. It rained all week but we still had a great holiday utilising fully the covered deck and outside living are and the beautiful pool. Great value for money and I would do it all over again. “This ‘Amazing Property’ is the main reason why our family get together/birthday was such a success. 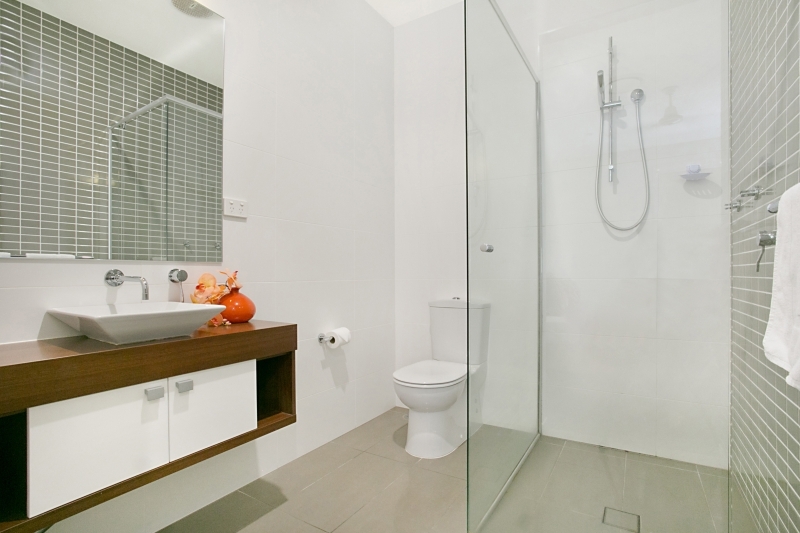 It’s openness, multiple living areas and share size accommodated everyone’s needs perfectly. “Xanadu was AMAZING! Most days/night spent in the outside dining area overlooking the pool and canal. 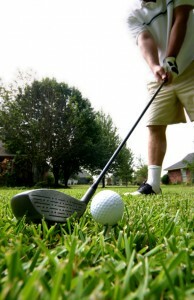 Walking distance to Pacific Fair (great shopping!) and Jupiters. “Brilliant! Beautiful Property. House met all expectations. 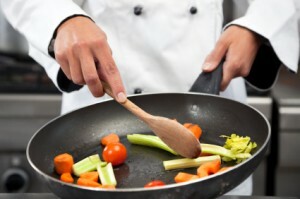 Prime location, great facilities and great customer service. 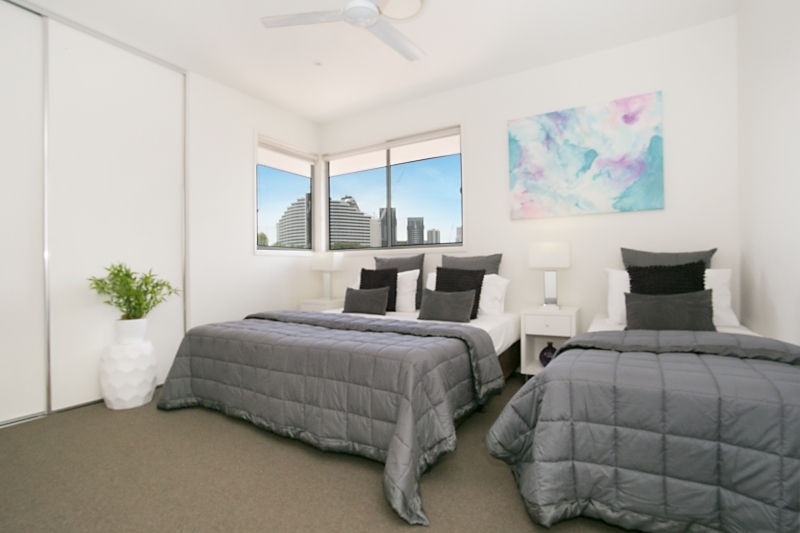 Would recommend staying at Xanadu at Broadbeach. “Great family weekend. Great spot, close to Pacific Fair for all shopping needs and also easy access to Movie World etc. “Stunning Property. Idyllic Location. Our second stay at Xanadu was as perfect as our first! 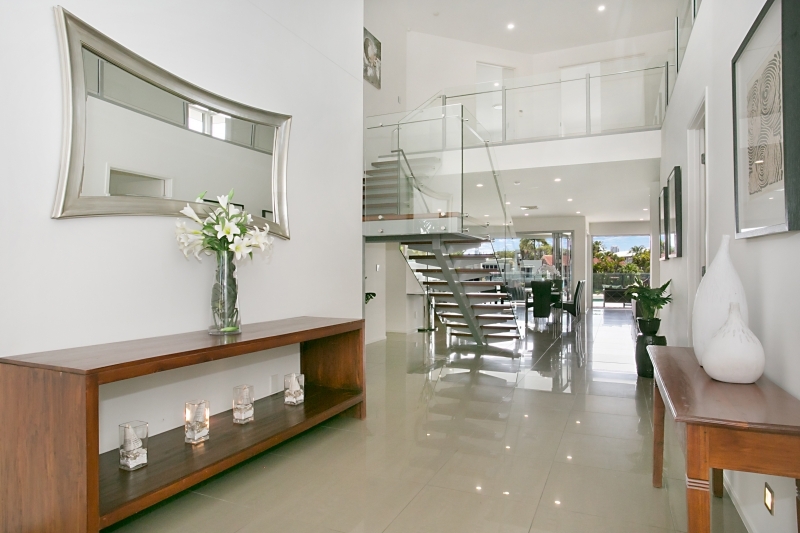 First impressions last with the aesthetics of the property being breathtaking. “Excellent Accommodation. Presentation of the property is excellent. It is close to both Pacific Fair and Jupiters Casino. The pool was great, excellent new BBQ, bathrooms and bedrooms were spacious and clean on arrival. The staff at Elite Property were very helpful…..would recommend it to all!!! “Beautiful Property. Loved staying here – it’s about a 5 min walk to pacific fair mall which is so convenient and a 15 min walk to casino! Pool was gorgeous and the outlook was great! “Beautiful Luxurious Property. We thoroughly enjoyed our stay. From the moment we walked through the double doors we were wowed by the high ceiling and luxurious fixtures. The ducted air conditioning throughout the house made our stay very enjoyable. The swimming pool and pool table was perfect for the family. The most stunning bed room was the Master with lots of space, deep bath, and massive shower with an amazingly large shower head on the ceiling. To top it off there was a generous walk in robe. This property is absolute luxury. I would highly recommend this property for any groups looking for a spacious, luxurious, beautiful holiday home. “Everything you could Want. 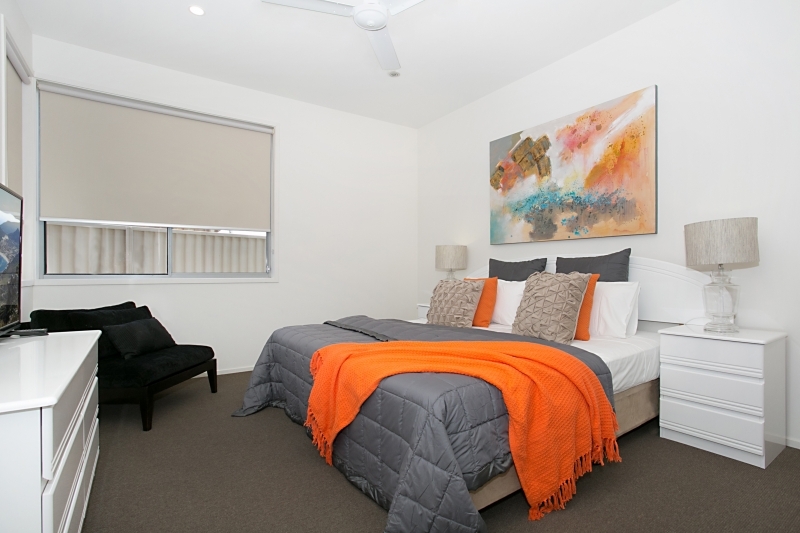 This property caters for all your needs and within walking distance for anything you didn’t have. Would definitely stay here again. “Great house in a great location” – House was perfect for a large group in walking distance to casino, Pacific Fair and Tram stop. Real Estate was very easy to deal with and all enjoyed our stay. “Outstanding, Comfortable Family Home” – Our extended family enjoyed a week at Xanadu during early August and found the property to be everything we hope for (and more). There were 11 of us in all and we fitted in very comfortably. The location is excellent and all facilities are within easy reach – Pacific Fair shopping just a few minutes walk away. The home was spotlessly clean and all amenities worked perfectly although the pool table is a bit cheap and poor quality for proper play. Security is excellent and there is more than enough storage for everything needed on holiday. Arrival experience was very easy and we were well acquainted with what to do and how to gain access. Would definitely stay again and highly recommend this property (and the agency) to others. 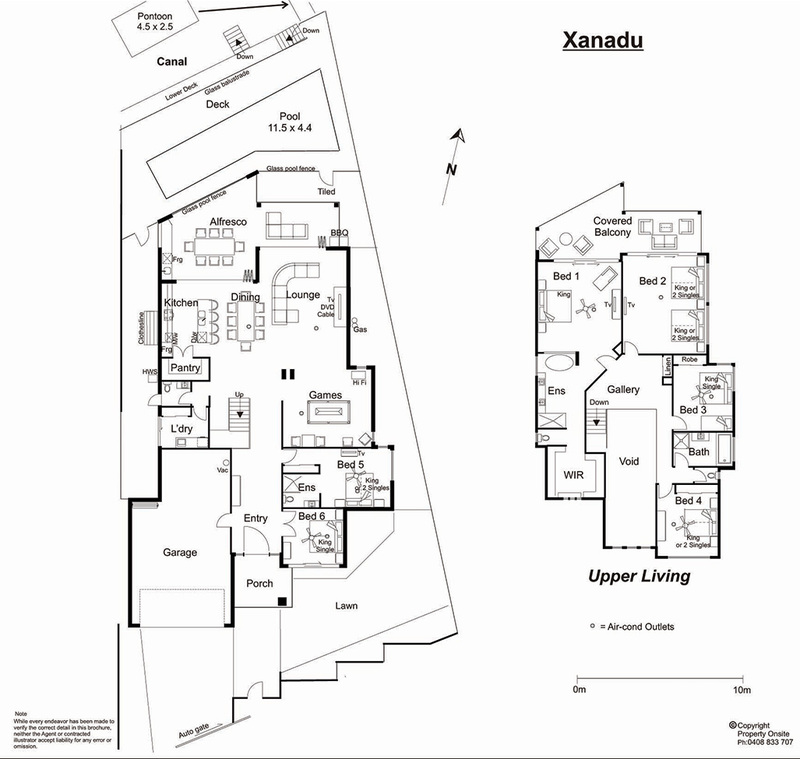 “Absolutely stunning property” – We stayed in luxury at Xanadu. 13 of us had the best holiday ever! “Great property and location” Great property which was in a great location. Very nice and peaceful area. Great place for a family get together” – We stayed here for our son’s wedding – easily catered for 30 people for dinner one night. Great location. 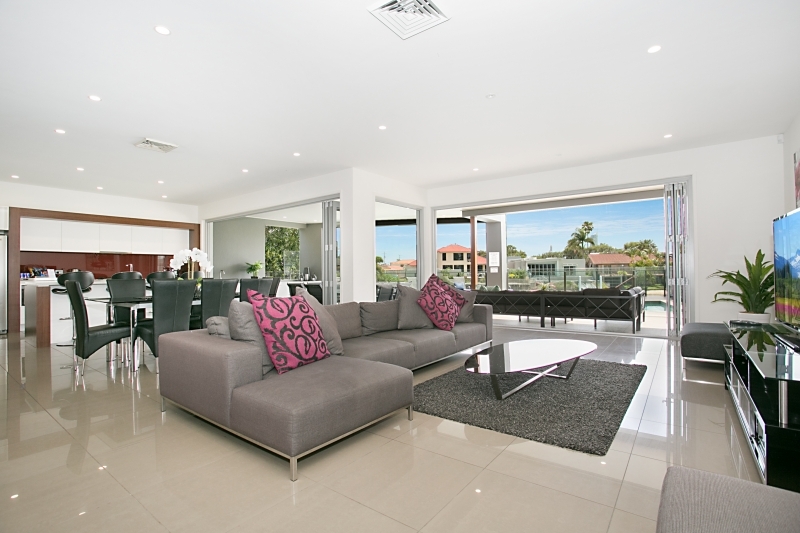 All guests were very impressed with the size and layout of the house. “Really good property, well maintained” We had a great family get together here. Easy to run, plenty to do to keep children happy. Would recommend it. “Large luxurious property” This property lived up to all expectations with excellent facilities, high standard appliances, excellent bedroom choices and plenty for the children to enjoy. our extended family of 6 adults and 4 children had a wonderful stay. We were close to shopping and the beach end enjoyed some fun early morning walks with coffee readily available nearby. “Absolutely Incredible” A group of us stayed at Xanadu Waterfront for a long weekend away, and WOW it was absolutely incredible. The house was extremely spacious, clean and offered the perfect escape from reality for our trip. The house is in a perfect location as you’re far enough from the city to be in silence, but still close enough to walk to the beach. It was great for just laying around the pool, and the view was breathtaking. Overall I would definitely stay here again. The check in/out process was easy, and made our holiday a complete stress free one.